Home » Our Work » Stories of Children » Manasi wants to make her mother proud by saving lives as a doctor! 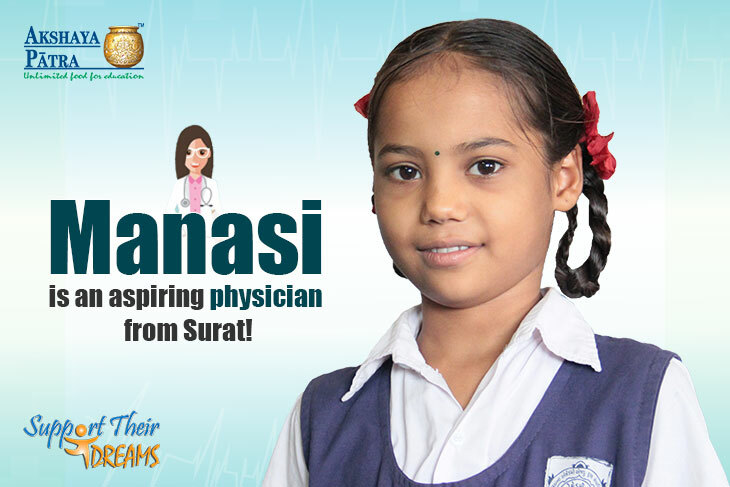 Manasi wants to make her mother proud by saving lives as a doctor! Manasi’s mother is a homemaker, while her father works in a factory. She has an elder sister, who studies in Std VII and a younger brother, who studies in Std II. She likes to participate in various competitions that are held in school. She stood 2nd in an essay-writing competition that was held recently to spread awareness about the Swachh Bharat Abhiyan (Clean India Mission). The young girl advocates the importance of keeping surroundings clean and elaborates on how cleanliness ensures that we don’t fall ill. Math is Manasi’s favorite subject because she finds it challenging to solve mathematical problems. As for sports, she likes playing kho-kho and kabaddi. Manasi’s eyes brighten when she talks about Akshaya Patra’s food. She likes it a lot because it’s tasty, like homemade food. She lists the dishes that are served in her school like khichdi, varan (daal), poli (roti) and others. Of these, she says, khichdi is her favorite and adds that food is important for our growth because it provides necessary nutrients. We are sure Manasi will make her mother very proud when she grows up. We wish her the best in pursuing her dream of becoming a doctor!